There are many ways to get involved at Trinity. Groups for young and old - being involved brings you closer to members of the congregation and puts your faith into practice. Studies indicate volunteering for a cause bigger than yourself, and having a network of support and friendships helps individuals find contentment and happiness. Find out more about the groups at Trinity here. TLMM is our men's bible study and christian service group. See the forms-schedules page for our calendar of events for 2012. TLMM meet every 3rd Sunday of the month from 7:45 am – 8:45 am in Weiblen Hall at Trinity Lutheran Church. 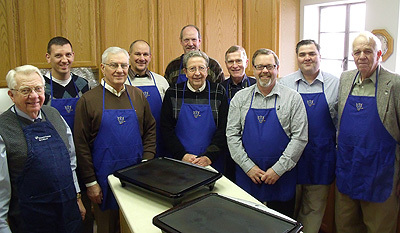 Our men’s bible study group meets on the 1st Sunday of every month at 8:00 am in Weiblen Hall at Trinity Lutheran. We invite you to experience our fellowship as we work together in Christian service. Christian service (in): our church, our community, and our world. Bed Brigade builds and donates beds to needy families in Williams County. Trinity sponsors a team in Bryan's Church Softball League. Trinity participates in softball, basketball, and other sports activities. Please send your announcements and information on any Trinity Sports you would like to see posted on the Trinity website to Rhonda Fackler at the church office. The youth at Trinity are involved in many activities and fundraising projects. We want to keep in touch with those who are in college. Please call the church office or email your address to the church.